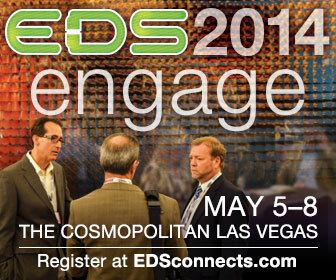 Returning to The Cosmopolitan in Las Vegas, Nevada for four days (May 5 – 8, 2014) is the world’s premier Electronics Distribution Show – EDS 2014 . Unlike many tradeshows, EDS is more about networking and relationships, rather than products. Attendees quickly realize the emphasis of the event is on the quality of audience and exhibitors; Fewer than 400 companies will be exhibiting. This environment fosters a “sell-through” instead of “sell-to” experience. EDS promotes industry connections between Manufacturers, Distributors and Sales Representatives. If you are a new or established vendor looking to increase your sales territory coverage, the “matchmaking” services are an excellent place to start your research. Similarly, Manufacturers Representatives that would like to discover additional suppliers for their line-card can find information for new engagements. Distributor attendees are looking for new lines to carry, compatible with the needs of their distributor base; or for new products from their existing vendors, and/or to build relationships and to find out what’s going on in the industry. Be prepared to tell them who uses your products, and how they differ from similar and/or competitive products, they expect new vendors to have a program in place, including recommended inventories, selling prices, return policies, lead generation and marketing support. Representative attendees are at EDS to facilitate dialogue between the distributors that they call on and the manufacturers whose products they bring to market. They may also be looking for new line opportunities, and to meet with their current principals for review and planning. Representatives who are looking for product lines want to be sure that a new line will fit well with the other products they sell. They want exclusivity in their clearly defined territories. If you do not have an established customer base, expect them to want to be paid fees for introducing your missionary line. Manufacturer attendees may be looking for new distributors, or new representatives, or both; or they may be at EDS only to interface with their existing channel network. They may be planning to introduce new products for their distributors to sell, or new strategies and programs. They know that at EDS they can get more done at less expense than via any other way of meeting with their channel partners. On-line registration is now open for industry professionals and is limited to two categories: “Reps and Distributors” and “Manufacturer” . For distributor and rep badges, the cost is $50, which is prepaid by association members when they pay their association dues. Authorized vendors can secure admission for $750 per company, which includes two badges. EDS participants are primarily for the interconnect, passive and electro-mechanical (IP&E) segments of the electronics market. However, many semiconductor and active-component professionals also choose to attend EDS. You can find a on-line list of Manufacturers, Distributors and Reps.
Make your Las Vegas reservations now, and have a great show at EDS 2014.